Have you ever considered buying a robot? Don't have time to travel to a Robot Expo? 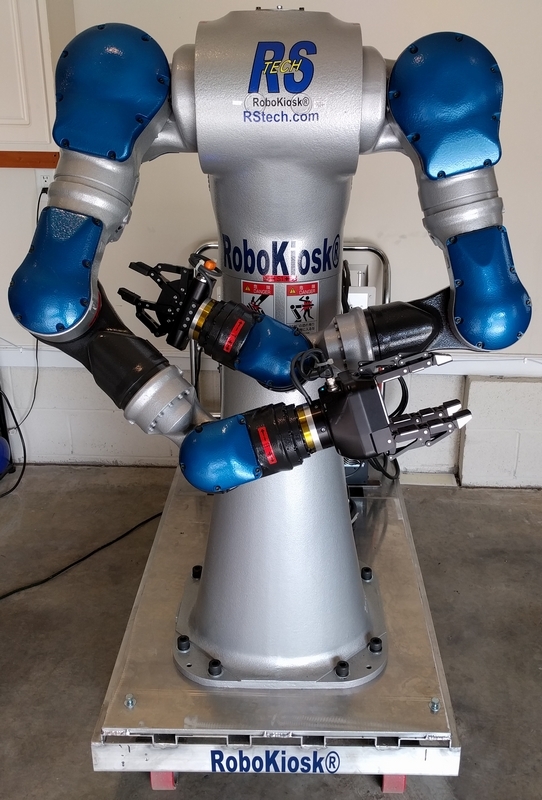 Our Robot Kiosks are designed to inexpensively and easily transport robot arms. We can bring the Expo to you using our RoboKiosk®. Once we're at your facility be it a factory, shop, or store, we simply wheel it to the actual spot where it might be utilized. Once in place we can perform; Research and Development ( R&D ), Proof of Concept Trials, and/or Demonstrations. We can use a real robot with your parts at the actual area where it my be used! What can robots do? Click on our YouTube video link to see a few examples. Do you have 2 processes that can be utilized with a robot but only enough funding to purchase 1? Get a RoboKiosk® as it can be accurately located to the same work position every time. Set it up at process 1 for first shift; take it to process 2 on second shift. Our Engineers have the knowledge and experience to simplify your processes. We have many designs available that include safety fences, light curtains, and anything else you'll need to be mobile and safety compliant. We currently have a 30 inch by 60 inch cart with a Yaskawa Motoman Dual Arm Robot model SDA10 with FS100 controller and Electric Grippers. The robot has 15 movable axis (degrees of freedom) with a 10kg (22.1 pounds) payload capability per arm. RoboKiosk® Mobile Robots can be used for a wide range of tasks. Television Shows, Movies, Robotic Special Effects, TV Commercials, bartending, concession stand assistant, the applications are numerous. Click on our YouTube video page link to see our dual arm robot cooking an egg sandwich. We've added more tasks, opening bottles and pouring drinks into glasses and plastic cups. This is a fully programmable mobile robot.